The Amaz!ng Meeting doesn’t officially start until tomorrow with the opening slate of workshops, but skeptics and critical thinkers have already descended en masse in Vegas. This afternoon (Wed.) I attended the volunteer luncheon at the hotel buffet. No, I didn’t crash it, I’m volunteering as a ticket taker for several hours tomorrow. There was an air of fun and frivolity as friends noticed each other in person and “touched each other for real, not on a computer screen,” as Jennifer Michael Hecht noted. At TAM you get to meet all sorts of people in real life, not just Twitter peeps. 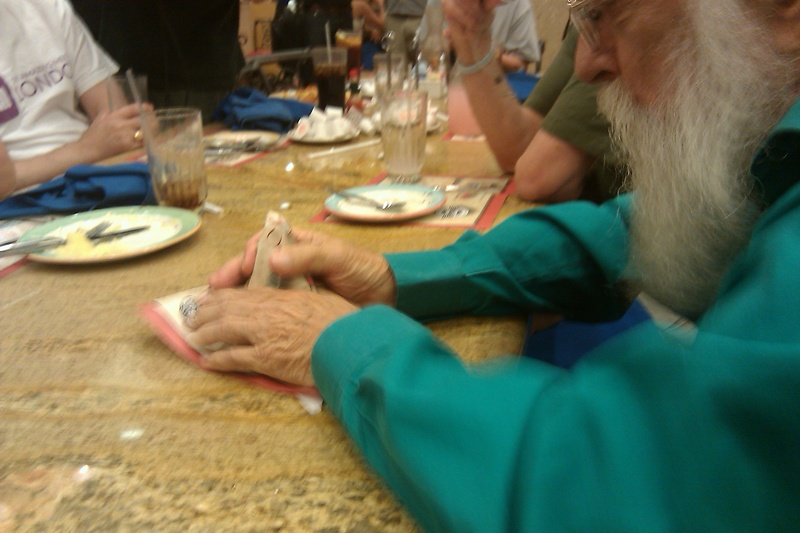 But don’t take my word for it, here’s a photo of James Randi performing slight of hand conjuring at the lunch table. This entry was posted on Thursday, July 14th, 2011 at 9:25 am and is filed under #tam9, Uncategorized. You can follow any responses to this entry through the RSS 2.0 feed. You can leave a response, or trackback from your own site.